Ice plants, a variety of herbaceous succulents in the genus Delosperma, consist of mat-forming succulents that hail from South and East Africa. Known for their daisy-like blooms and low-growing, matting form, ice plants are useful plants to grow in groups as a ground cover. Their fleshy, bright green foliage is often evergreen, providing color all year. Ice plants are hardy plants, as they're tolerant of heat, drought and frost, with some varieties persisting into winter. 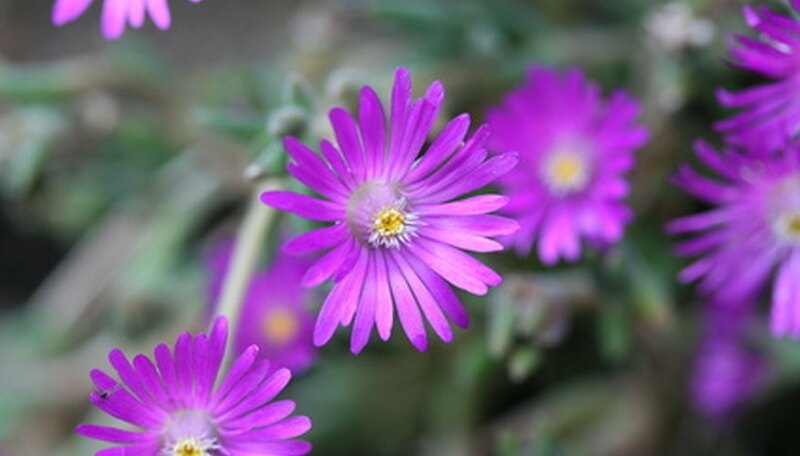 Ice plant Kelaidis (Delosperma Kelaidis) is an herbaceous ground cover that blooms from June to September. It is mat-forming to hug the ground with its spreading, dense and freely-branching tendrils. Kelaidis grows up to 6 inches high and has a spread of 1 to 2 feet. The 1-½-inch-wide, salmon to pink flowers have yellow centers and close up at night and during cloudy days. The fleshy, green, succulent, jellybean-like foliage on Kelaidis is often tinged with purple during winter and covered with transparent flakes that resemble small pieces of ice, hence the name ice plant. They grow best in full sun and well-drained, dry, sandy soil. Versatile, ice plant withstands drought and heat. They grow in USDA zones 4 to 8.
Cooper's hardy ice plant (Delosperma cooperi) is a rapidly growing succulent ground cover that blooms from summer until fall. They grow 6 to 7 inches tall and have a spread of 24 inches. Their low, mat-forming growth habit makes them suitable plants to grow in rock gardens or along a garden bed or border. The dark green, shiny, succulent leaves on Cooper's hardy ice plant are drought-tolerant to withstand periods of limited moisture. The masses of 2-inch-wide, daisy-like blooms are bright pink to purple. Cooper's hardy ice plant grow best in full sun to light shade and well-drained soil. They grow in USDA zones 6 to 10. Hardy ice plant (Delosperma nubigena), also called cloud-loving hardy ice plant, is a variety of ice plant that is evergreen, meaning it retains its foliage color year-round. It has a rapid growth rate and grows 2 inches tall with a 3 foot spread. The solitary, daisy-like flowers on hardy ice plant are yellow to chartreuse and emerge in spring to light up the plant. The shiny, bright green, thick and fleshy leaves on hardy ice plant grow just over 1 inch long and cast a red tinge in fall. Hardy ice plant is drought-tolerant and grows best in full sun to light shade and well-drained soil. Plant in USDA zones 6 to 9.